The 2019 IFSA junior freeride season is underway and the CBMST athletes have been taking advantage of a good start to the winter at home to get ready. Over MLK weekend a 10-athlete strong contingent went Snowbird, Utah for the first National event of the season. Photo: Jon Clay Patterson in 2nd at Telluride. 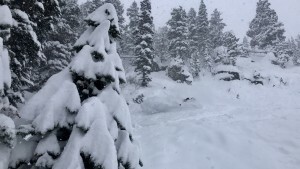 Driving through a snowstorm, the team arrived in Little Cottonwood Canyon to find stellar conditions for freeride but not necessarily for running a competition. The blowing snow and wind made visibility hard and forced the competition to a one-run format, with avalanche conditions forcing a road closure and delaying the team’s return home until Tuesday. The CBMST only had athletes in the 15-18 ski categories, Avery Bernholtz and Ella Haverkampf represented for the women with Jon Clay Patterson, Kye Matlock, Marko Alling, Owen Berv, Seve Petersen, Holden Bradford, Carson Hildebrandt, and Nate Ball over in the men. Ella Haverkampf celebrating 3rd place and a closed Canyon at Snowbird. The tried and true Silver Fox venue was used on Sunday with hopes that finals would be on the same place on Monday. The athletes knew that the potential for only one run was very real so the juniors were sending. It was feast or famine out there and unfortunately Avery Bernholtz, Nate Ball, Jon Clay Patterson, and Marko Alling went down trying to manage the deep, yet firm, snow at high speeds in flat light. Other members of the CBMST were able to find success in the most competitive national of the season; Snowbird’s central location in the Western US tends to have that effect. 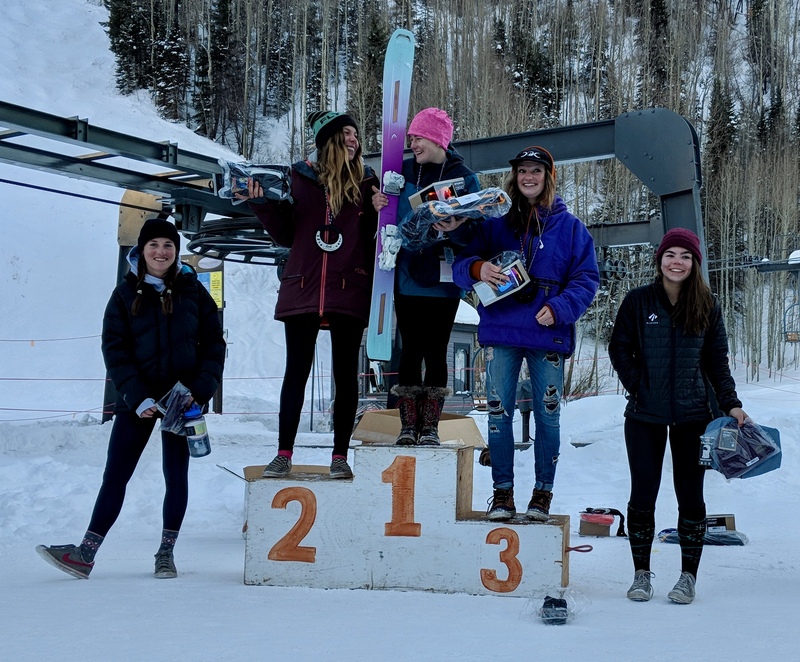 Ella Haverkampf sent Standard air and greased through rock chute to take 3rd place out of the 30 in the 15-18 Ski Female division behind a Britta Winans and Elena Silverman, both riding for SquawFree in 1st and 2nd, respectively. A bunch of the CBMST athletes found creative ways through the bottom tree area after sending airs in the top section of the venue. Holden Bradford absolutely lit up the venue with big turns and adding a little style to every air he took. That was good enough for 2nd place out of 66 athletes in 15-18 ski male behind Leon Mcguire of Altabird Freeride. Kye Matlock threw a massive 3 up top and laced his turns to his bottom feature, getting a little cat-out-the-window off his take off but recovering for the landing and finishing in 6th place. Carson Hildebrandt had a similar run to Holden’s but amidst the stiff competition that put him in 11th only 2.13 points back from 1st. Owen Berv put down his strongest run to date with huge airs up top and out the bottom to finish in 16th. Seve Petersen rounded out the CBMST’s solid first effort of the season tied in 24th, no small feat for his first effort on Silver Fox against the best in the country. 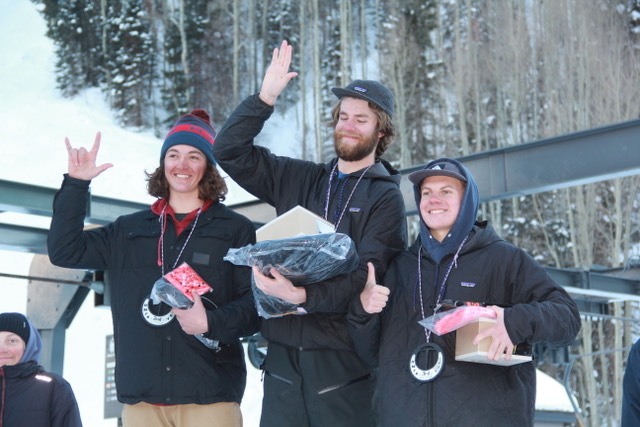 Cooper Wight in 3rd place at Telluride. 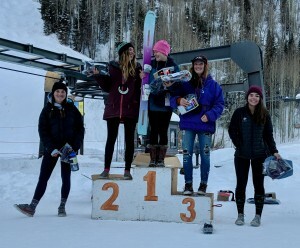 Following Snowbird, a group of 5 CBMST athletes went to Telluride for a Regional event, worth half as many points as a National for the overall rankings at the end of the season. Telluride uses the short but sweet Genevieve venue off of Prospect Express for their Regional. Cooper Wight and Eli Nolan got their competition season underway in the 12-14 ski male division. Cooper was ready to throw down and went as big as anyone on the day to finish in 3rd out of 27, just a point behind the leader. Eli Nolan executed his plan and put down a sold 14th for his first effort in the 12-14 category. 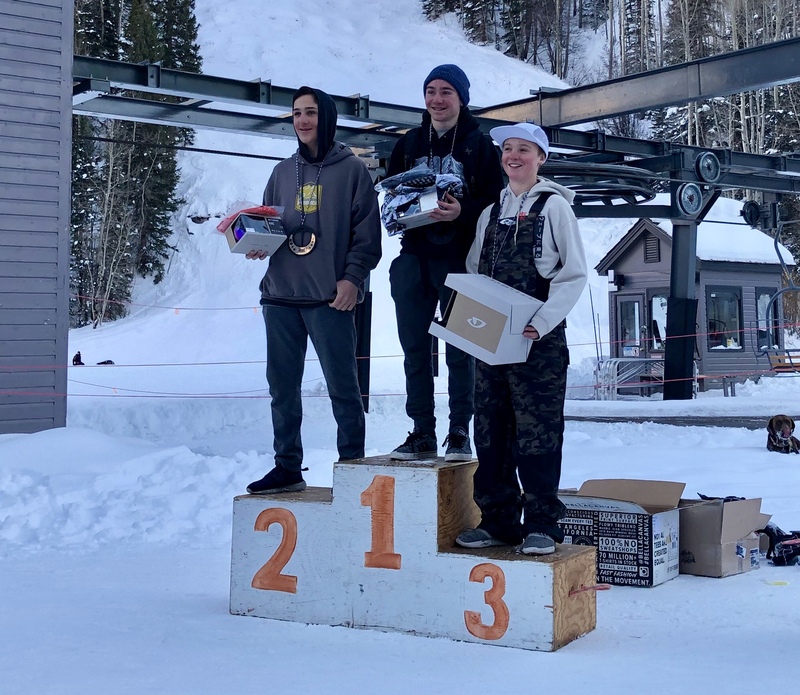 Avery Bernholtz and Jon Clay Patterson were able to get some redemption after Snowbird with a 4th and 2nd in their respective 15-18 ski female and male divisions. Jon Clay hit a big, unique air with aggressive style while Avery’s speed and fluidity put her less than half a point behind the leader out of 29. Luke Shull got in on the action on his telemark gear sending his biggest air in his competitive career so far and dropping knees the whole time. It earned him 6th out of 28, just a couple points behind Jon Clay. Avery Bernholtz in 4th at Telluride. The CBMST has home field advantage this weekend with the Regional taking place at CBMR this Saturday. Come out and support your local junior athletes in their quest for freeride prowess and a chance to build points to qualify for the North American IFSA Junior Champs in April. Keep the CBMR National event scheduled March 8-10 on your calendar as well, we’ll see you out there!